Age: Candidate must not be less than 18 years and more than 44 years as on 03rd March’ 2018. The upper age limit is relaxabla by 5 years for SC/ST(P)/ST(H) candidates, 3 years for OBC/MOBC and 10 years relaxation to person with disability (DIVYANG) Reservation of physically handicapped person (PWD) will be as per Govt, rule. 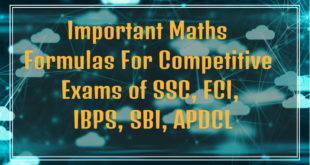 Tie-Breaking of Marks in the case of two or more candidates obtaining equal marks, for such instance or case age preference will be given to the candidates older / senior in ago will be placed higher in merit.